I read this article and found it very interesting, thought it might be something for you. 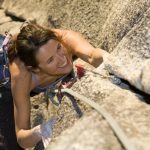 The article is called How to write the perfect About Us page and is located at https://copychief.com/the-perfect-about-us-page/. Your About Page isn’t about you. What else would you write about, if not yourself? And that’s how a lot of people approach their About Page. They write about their life story. Their awards and accomplishments and credentials. They produce this beautiful, epic autobiography. But when prospects see that wall-o-text, they click away. Other people take the opposite approach to their About Page. So they churn out some generic copy, just so they have something on the page. And when prospects see that, they do the same thing: click away. The About Page is one of the most-clicked pages on most sites. And they want to know that before they’re willing to keep reading your site. And before they hand over their email address or their credit card. So when you treat your About Page like a red-headed step-child, you’re missing a big opportunity to capture readers and prospects. In fact, if it’s compelling enough, readers won’t need to see any other page on your website. When prospects click on your About Page, they’re looking for answers. Why should they listen to you? Can you really help them? Is this interesting? What’s in it for them? You need to talk about yourself as it relates to them. Answer their questions. Calm their fears. Talk about what interests them (and that’s usually themselves). That’s where your market research comes into play. This is about more than your name and title. You also need to get their attention and create a connection. If that sounds somewhat familiar, it’s because it’s the first part of The 60-Second Sales Hook. Hi, I’m Kevin Rogers. Six years ago a blood infection I contracted during a routine dental cleaning left me minutes from death. A heart surgeon saved my life, but the new medications were killing me all over again. Then I discovered a natural solution that has helped me get into peak condition and rid myself of dangerous and expensive prescriptions forever. Even if you’ve never been in that situation, it’s compelling. There’s a hurdle, a discovery, and a positive effect. And if you have been in a situation like Kevin’s, if you’re on medications that are killing you right now, he’s got your undivided attention. Even if yours is not a personality-based business, I still want to know about the man or woman behind the curtain. Who started the business? Who’s running it now? People want to do business with other people, not with company names and logos. Here’s where you dive more into what exactly you offer, to whom you offer it, and what makes you different than all those other clowns. Steve helps men over 40 lose the beer belly, even if they’ve never set foot in a gym. Kelly is a sleep coach for new parents and their infants, guaranteeing better sleep in just one week. Sara helps people diagnosed with pre-diabetes avoid full-blown diabetes, through 10 easy lifestyle changes. Each of those examples answers who they serve, what problem they solve, and what makes them different (and more desirable) to their target audience. Your USP has to be compelling if you want your About Page to convert. So take some time with it. And for detailed instructions on how to develop your own USP, check out this Copy Chief post by USP expert Ross O’Lochlainn. How many other people have you helped? What specific results did they get? 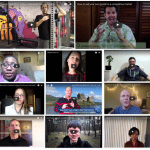 A great way to answer these questions is through testimonials. 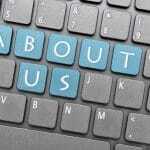 Specifically, testimonials from your ideal customers that provide proof of results. For instance, if you’re Steve the fitness pro, you need testimonials from other men over 40 talking about how much weight they lost. How quickly and easily they lost it, even though they hated the very idea of going to a gym and turning into some kinda “bro”. Here’s where you can add third-party proof. Again, these things are technically about you, however, the reason you include them is to reassure your prospects. Are you personable? Are you speaking like a human being, or are you using hypey jargon like some sort of marketing bot? This is the time to show a bit of your personality. If you consider yourself a “comic book geek,” include that. If you can pull off a joke, go for it. Personally, I love self-deprecating humor. Just be careful. If you’re not sure if it’s funny, either run it by a few brutally honest people or leave it out. The copy answers the questions above, it gets the prospect all hot and bothered, and then…nothing. There’s no call to action. You leave them to wander around your site, guessing about the next step to take. Walk them through it. What should they do next? Join your mailing list? Check out your sales page? Call you? A good About Page spells it out for them and includes the link, button, form, or whatever-it-is so they can take action right then and there. Here is a great example of an About Page, by Ramit Sethi of I Will Teach You To Be Rich. We’ll take a look at how he talks about himself, in relation to his prospects. Ramit has his name right at the top, along with a photo. He introduces himself as an author and the founder of I Will Teach You To Be Rich. He had to pay for college on his own. So he worked hard to win scholarship money, tried to invest it, and he lost half his money. Ouch. There’s the hurdle. The positive effect is that he was able to automate his finances, while enjoying lattes. Then he applied the same principles to other areas of his life: career, business, relationships, fitness, and more. He’s not about cutting lattes and out-frugaling everyone else. He’s about mastering big financial wins, earning more, and using systems to create a rich life. That’s compelling to anyone who’s tried cutting lattes and making a budget, only to go on a caffeine-fueled Amazon shopping spree one week later. In other words, it’s not about him. It’s about why you should listen to him over all those other guys. Subtle, yet powerful. Ramit helps more than 500,000 learn how to use psychology and systems to live a rich life via his newsletter. This page really spells out what’s in it for you and what results you can expect. Ramit has said that a name like I Will Teach You To Be Rich just sounds scammy, however, it’s what he started with, and he decided to stick with it. He’s been in national magazines, he has a best-selling book, and he’s been on all of the major media companies. Note: Including the media logos adds another layer of credibility. It just looks more legit. Are you even thinking about the somewhat-scammy name of his company? I sure wasn’t. 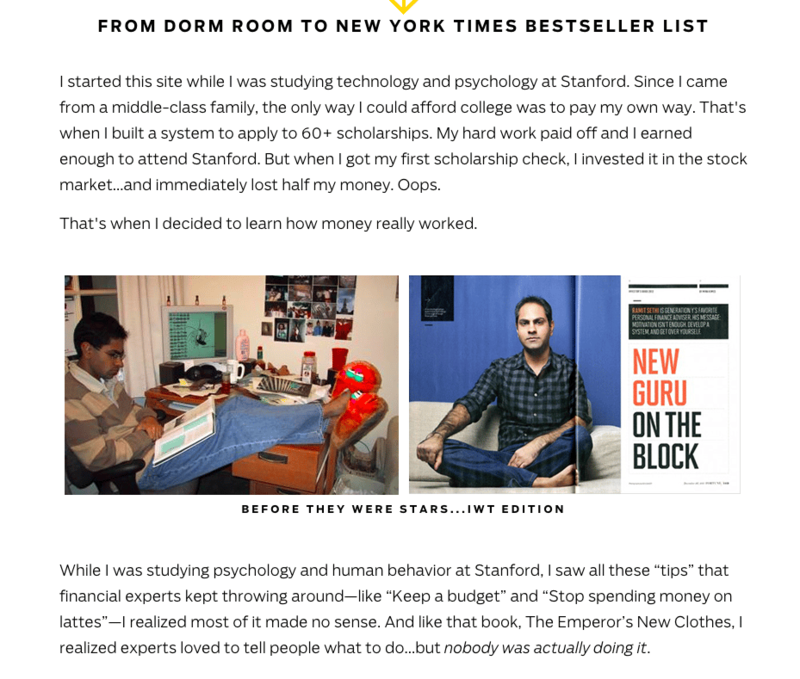 Ramit includes his personal story about investing one of his scholarship checks in the stock market and losing half of it. That, along with a photo of his college self wearing Elmo slippers, is very relatable and personable. Now, being likable doesn’t mean being likable to everyone. Ramit definitely isn’t. Frugalistas hate him, in fact, and that’s by design. Being likable means being likable to your ideal customers. And Ramit’s personal touches on his About Page are appealing to his target audience, who are into self-improvement and for the most part have a sense of humor. This is at the bottom of his About Page, right before the sign-off. 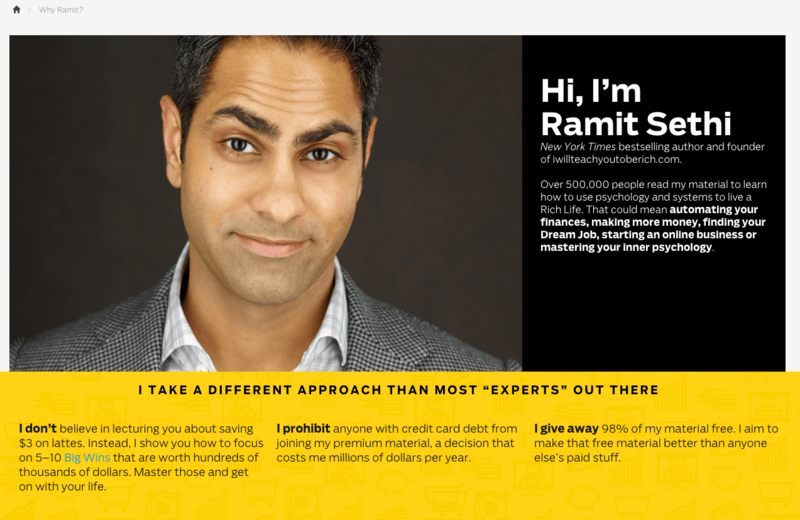 Ramit has several programs, so he has what I call a “Choose Your Own Adventure” call to action. 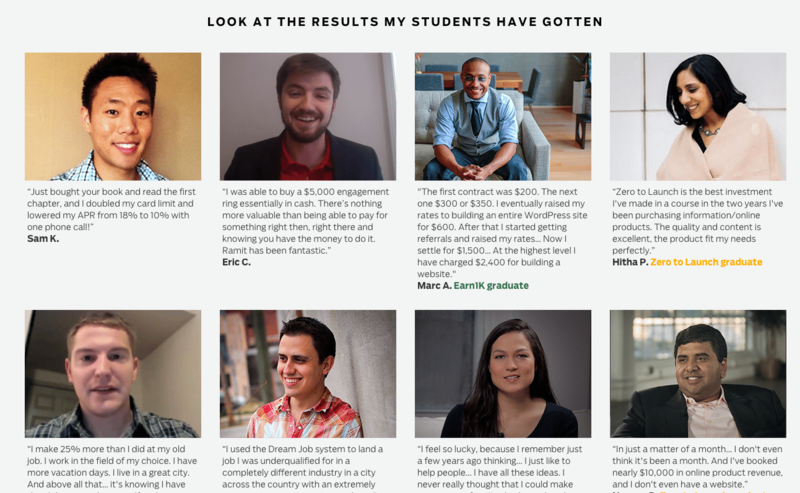 You can earn money on the side, find your dream job, or save more money. Choose your #1 goal and opt-in. There’s no question about what prospects need to do next. Three options, three buttons. Okay, so let’s apply all of this to YOUR About Page. Take the list of questions, and see if your About Page answers them. Is this for me, and why should I buy from you? How do I know you’re not a dirty scammer person? Would I want to have a beer with you? If your About Page doesn’t answer any of those questions, fill in the missing pieces. Then, delete anything that’s only about you and not about your ideal customers. And finally, if you’d like some feedback, send a screenshot of your before and after to me at april@copysprout.com. Wow. What a thought provoking post for an often under-looked page. And the example you used makes all the concepts very clear. Great post! Thanks, Gerald! Glad you found it useful. This is a monster post. According to big data tests and lots of articles Ive read, About pages are the first place that most people look and he second most popular page visited. I know for me I pay much more attention to them now. Time to redo my about pages. This Is an amazing breakdown of the magic in crafting the perfect About page and the timing is perfect for me. Thanks for the blueprint and great content! Thank you, Mark. Would love to see how your About Page turns out. Terrific article, April. Tons of eye-opening insights. Thanks for sharing. Great post! And you picked a good page to dissect too.